Found 8 file extension associations related to CCS64 and 6 file formats developed specifically for use with CCS64. 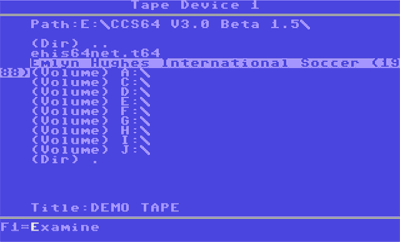 CCS64 a shareware Commodore 64 Emulator for PC. It was developed by Per Håkan Sundell as a Master Thesis at university in 1995 and have been expanded a lot since then. If you need more information please contact the developers of CCS64 (Håkan Sundell), or check out their product website.